On Saturday, July 28, at 10:05 p.m., a male, later identified as 25-year-old James Michael Kelley, from San Bernardino, was walking southbound on Coast Highway in Laguna Beach. According to reports, as Kelley approached a family that was walking northbound on Coast Highway, he knocked the mother to the ground and took her purse. “The woman’s teenage son grabbed Kelley’s legs in an attempt to trip him. As the suspect lost his balance, he turned and struck the teenager with a black metal flashlight,” Laguna Beach Police Department PIO Sgt Jim Cota said. “The woman’s husband chased after Kelley who had fled southbound on the sidewalk. When he caught up and confronted him, Kelley struck the husband in the head with the flashlight, causing a large cut,” Sgt Cota continued. “Kelley then entered a white vehicle parked nearby and accelerated in reverse toward the husband and a nearby witness, before pulling the vehicle out onto South Coast Highway and fleeing northbound,” Sgt Cota said. Shortly thereafter, a Laguna Beach Police officer located Kelley’s vehicle in north Laguna Beach. The vehicle initially yielded for the officer. However, when the officer attempted to hold the suspect at gunpoint, Kelley again fled. A pursuit was initiated and continued into Newport Beach. The Newport Beach Police Department assisted and placed spike strips on Coast Highway near Bayside Drive, deflating all four tires. Kelley was taken into custody without incident. The weapon was located and one of the victim’s credit cards was also found in the vehicle. Kelley was booked for robbery, assault with a deadly weapon, and reckless evading of a police officer. Cota added that the family was on vacation in Laguna Beach from a small town in the Bay Area of North California when tragedy struck. LBFD congratulates and recognizes Firefighter Brian Adams for his recent successful completion of Paramedic School at Saddleback Community College. This process started for Firefighter Adams seven months ago and included three months of didactic classroom, two months of clinical shifts at a local trauma center and 576 hours of ride-out shift with OCFA at Station 19. Once Firefighter Adams becomes a Nationally Registered Paramedic, he will be working in the capacity of a Firefighter Paramedic at Station 1. Firefighter Adams’ paramedic training and position was funded through Measure LL. Once certified he will be one of 23 Paramedics in the Laguna Beach Fire Department. On August 11, 2017, at 1:30 a.m., LBPD officers responded to a fight in progress at The Saloon in the 400 block of S Coast Highway. Officers contacted two separate victims of an assault and began an investigation into who committed these acts of violence. At the conclusion of the initial investigation, it was determined that three male subjects assaulted two male Laguna Beach bar patrons and a Good Samaritan female who tried to intervene. Both male victims sustained injuries, including broken bones and lacerations. The female victim sustained minor injuries. LBPD detectives began a lengthy investigation in the search for the individuals responsible for the assault. Over a dozen interviews were conducted during the investigation and hours of video reviewed. Jeremy Bishop, 37, Ontario, was charged with assault with means likely to produce great bodily injury and sentenced to 180 days in jail and formal probation. Daniel Little, 28, Prescott Valley, Ariz., was found guilty of assault and battery and sentenced to 120 days in jail and formal probation. Joshua Little, 28, Prescott Valley, Ariz., was charged with assault with means likely to produce great bodily injury and sentenced to two years in prison and mandatory Post-Release Community Supervision (PRCS). “This was the culmination of excellent police work coupled with a steadfast determination by our investigations unit to apprehend the offenders,” said Capt Jeff Calvert in a statement. On Tuesday, July 24, officers conducted a vehicle stop in the 200 block of Aster Street following an illegal turning violation just after midnight. Officers contacted the driver and passenger. Both from Banning, they denied being on probation or parole. A records search was conducted and it was learned that the driver, Matthew Schelin, 28, was indeed on probation. He subsequently consented to a vehicle search. “He was searched and a large amount of cash was located inside his wallet in smaller denominations,” said LBPD spokesperson PIO Sgt Jim Cota. According to Sgt Cota, he stated that he sells items on Amazon and [has] two Airbnb homes. LBPD had reason to believe he was selling more than this. Schelin came clean and stated that the backpack was his. He was arrested for possession of a controlled substance for sales twice. He was booked and transported to OCJ, with bail set at $25,000 for both charges. On Tuesday, July 24, at 6:16 a.m., at Third Street and Mermaid Street, a large flatbed truck got stuck carrying a heavy load up the hill. Perhaps the idea of an alternate route didn’t cross his mind, obviously not a local. The event snarled traffic for an hour, prompting a Nixle alert from LBPD. Stu News photographer Mary Hurlbut saw said truck in action, well, actually, inaction. “A large tow truck had to respond and was able to remove the truck,” said Jordan Villwock, LBPD Spokesperson and Emergency Services Coordinator. In a tragic accident, a 15-year-old boy was struck by a boulder, severing his arm and pinning him against the rocks at Emerald Bay Beach on Wednesday, July 18. He was airlifted to UC Irvine Medical Center in serious medical condition but is expected to survive. Local and county emergency services quickly responded to the teen who was walking along the rocks about 100 feet offshore at Emerald Bay Beach with a friend. Orange County Fire Authority spokesperson PIO Capt Tony Bommarito said that he thinks the boy could be a local. “His friend said that they’ve walked the area before. And his mom was with him. I can only speculate that they are [locals] unless they are a guest of someone,” Capt Bommarito said. He explained that the boys were walking on the rocks along the waterline at the bottom of the cliffs. Basically along the waterline climbing up and down the rocks that were there, not scaling the cliffs or anything. “His friend was with him. They were walking and a boulder came down about the size of a cooler, 400-500 pounds coming down. Hit him, knocked him down and basically landed on his right arm and severed his right arm in between his elbow and shoulder,” Capt Bommarito said. At the same time, he said the teen was knocked backwards and his foot got stuck in a crevice or a rock. They had to move the boulder so they could get him dislodged from where he was stuck. “There’s no damage to his foot; it just kind of got lodged and they couldn’t get him out of it until they moved the boulder that cut off his arm,” Capt Bommarito said. LBFD Engine 201 was integral in saving his life. “They had what are called rescue airbags or heavy rescue airbags. They’re real flat, but we can stick them under things and in really small spaces, and we expand them with an air bottle,” Capt Bommarito said. The devices can lift thousands of pounds. As of 4:30 p.m. Thursday, he said he hadn’t heard any updates about the teen’s condition. He went to the hospital on Thursday morning to check on him but was unable to see him. As for safety precautions in that situation for beachgoers or adventurers, he said there are really none. He wanted to thank all the agencies involved in the rescue calling it a collaborative effort, which included OC Parks Lifeguards, LBFD and Orange County Fire Authority. On Wednesday, July 18, a large barge was spotted beached at Thousand Steps Beach. Stu News reader reports started coming in around 9 a.m. asking us what this barge was doing landing on our beach. Stu News looked into the matter. Greg Pfost, City of Laguna Beach Community Development Director, had some answers. He explained that the barge was connected to a private residential project that is under construction at Thousand Steps Beach. The property has two structures, including a guest house right on the sand, and then it has a house further up the slope. The City submitted the approval for the owner. The only other option would have been to use a crane and crane it in, but that would have been more expensive and cost prohibitive. “So they contracted this barge company. It’s the same barge company that was used by South Coast Water District years ago; they used the barge as part of their tunnel rehab project,” Pfost said. The barge first made a trip on June 18 to bring in materials to the home site and this was the second trip, which was to remove materials. The homeowner needed authorization from three agencies to move forward with their barge. The ocean is regulated by California Coastal Commission, the sand is a County beach in this case, and the home itself is on Laguna Beach land. So they were able to land because they secured all of the authorizations from the agencies they needed. Aliso Fish & Wildlife was involved in the review as well. The only other barge landing in recent history is the one he recalled earlier involving the South Coast Water District. Stu News reader Brett Keast shared a memory from the 1970s of a barge landing at Three Arch, although that area was not incorporated as part of Laguna Beach at the time. “Back in the early ‘70s my dad had a military barge land at Three Arch to bring in equipment and build volleyball courts and bathrooms,” he said. Even with these three known barge landings over the past decades, none have been on a Laguna Beach City beach. “To my knowledge there have been no barge landings on City beaches,” said Pfost. On Tuesday, July 17 at 6:49 p.m., LBPD conducted a vehicle stop in the 900 block of Glenneyre Street near Thalia Street. According to LBPD PIO Sgt Jim Cota, officers contacted a female, identified as Tustin resident Dianna Tateyama, 55. Ciprofloxacin is an antibiotic used to treat bacterial infections. Tateyama consented to a search of her vehicle. Inside the center console were three narcotic pipes and two empty baggies containing cocaine and methamphetamine. According to Sgt Cota, a female officer observed a clear plastic baggie hanging out of her bra. A search of the bra revealed two $100 bills and three small plastic baggies. Inside the baggies were cocaine and methamphetamine. Inside her wallet was $528.00 in cash. The baggies of narcotics were individually packaged with 4 grams of narcotics each. Tateyama was arrested and booked on four felony charges: possession of a controlled substance for sales, transporting a controlled substance on a highway, possession of a controlled substance, and sales of a controlled substance. According to LBPD, on Thursday, July 19 at 4:24 p.m., officers responded to Laguna Avenue and South Coast Highway to a report of someone spraying an unknown chemical on a City Trolley. LBFD responded as well and found no caustic agent or anything suspicious. The person who allegedly sprayed the substance was gone upon emergency responders’ arrival. He had gotten off the trolley and walked away, according to witnesses. The scene was cleared around 5 p.m. as if nothing had happened. No one was taken to the hospital and all of the trolley riders declined medical attention. Some of the trolley riders even admitted that the symptoms they were feeling could be psychosomatic, induced by thoughts of possibly being harmed. On Saturday, July 14 at 8:55 p.m., LBPD and LBFD responded to a fatal injury traffic collision on Coast Highway and Country Club Drive, which resulted in the death of Francisco Rojas, 27, of Murrieta, and injured three other occupants in his vehicle, including his girlfriend, 22, and two children, ages 13 and 3, one confirmed to be his child. According to a LBPD investigation, Laguna Beach resident Marshall Glen Eichenauer, Jr., 57, was driving his Chevrolet Avalanche north on Coast Highway, near Aliso Beach, when he broadsided a Nissan Altima that was making an illegal left turn from Country Club Drive, directly in front of him. LBPD Spokesperson PIO Sgt Jim Cota said Eichenauer, the surviving driver, a South Laguna resident, was arrested on suspicion of DUI. “Eichenauer displayed symptoms of alcohol intoxication. A DUI investigation was conducted and he was subsequently arrested for DUI. He consented to a blood test and we are awaiting results,” Sgt Cota said. The results should be in within a week or so. The traffic collision investigation is still underway. LBPD traffic officers will be working with the OCDA’s office for the possible filing of charges. Coast Highway was closed for over four hours near the accident scene. Eichenauer is the founder and president of a wealth management firm, Sagent Wealth Management, LLC located in Laguna Beach. On Saturday, July 14 at 10:45 a.m., LBPD, LBFD and Marine Safety lifeguards responded to an unconscious swimmer pulled from the water at Thousand Steps Beach. “Lifeguards performed CPR and the person is unresponsive so far. Mercy Air is en route for transportation,” said Sgt Cota, as rescue efforts were occurring on Saturday. A Mercy Air helicopter transported the victim to Mission Hospital Mission Viejo, where he was pronounced dead. According to sources, the man was identified as Brian Riggs, 52, of Aliso Viejo. “As far as the cause of what led up to the patient’s condition, the cause of death, I don’t think the coroner even knows that yet, they have to conduct their investigation,” Chief Young added. Hot of the press, yesterday at 11:04 p.m. in the Boat Canyon area of North Laguna, long-time resident Christopher Kling reported in a Stu News exclusive a horrific experience of the entomology variety. The unwanted guest, a cockroach, was the size of a silver dollar coin, Kling said, and probably the biggest he had seen in his life. “I told my neighbor about it, who reported back to me today, that he too had an intruder as well. Turns out the humidity is the culprit, and I want to confirm with all the neighbors that the roaches aren’t just at your place,” Kling said. Keep your eyes peeled and beware, Laguna! On Sunday, July 8 at 9:41 p.m., at the 800 block of Catalina Street, a caller reported “a 30 lb. raccoon hanging around the house.” According to Wikipedia, the average raccoon weighs between 7.7 and 20 lbs, meaning this was a very large and well-fed raccoon. A couple of days later, on July 10 at 9:21 p.m., also at the 800 block of Catalina, LBPD received a call from a resident about a “possible wolf” in their backyard. Moments later, the caller reported the “possible wolf” was now in their neighbors’ backyard. Animal Services was notified of the incident via email…and rest is history/a mystery. The resident requested further contact from Animal Services to resolve the situation. It is unknown what the next steps were. There have been at least five recent rattlesnake sightings reported locally, including one on Monday, July 9 at the 0 block of La Costa Court, and another one that day at the 900 block of Quivera Street; two on Thursday, July 5 – one at the 900 block of Park Avenue and one at the 3400 block of Bahia Blanca Way; and then two at the 3200 block of Bern Court within three days – one was an extra large snake and the other was likely a baby snake. On Monday, July 11 at 3:55 p.m., LBPD officers were dispatched to 3rd Avenue and Coast Highway amidst reports of a stabbing that had just occurred on a city trolley. According to reports, a juvenile male stabbed an adult male during an argument that quickly escalated. According to LBPD Spokesperson PIO Sgt Jim Cota, the suspect, a juvenile out of South County, pulled out a 3” to 4” folding knife and stabbed the victim in the hand. The physical and verbal altercation continued and the suspect tried to climb out of a window, which caused it to break. “Once on scene, two people were detained in handcuffs and officers were directed toward “Lovers Beach” where the suspect supposedly ran,” said Sgt Cota. “As more officers arrived, a search was conducted and more witnesses came forward to direct the officers to the suspect. “Two officers on the hillside above the beach tried to make contact with the suspect who was hiding in a cavern on the beach. The suspect eventually came out, although he initially acted as if he had no idea what was going on. When he realized he had no place to run, the officers were able to talk him up the hillside where he surrendered. The injured adult male was treated for a small cut on his left hand. According to Sgt Cota, the male juvenile suspect was eventually taken into custody for assault with a deadly weapon and later transported to juvenile hall. In addition to creating quite a scare for fellow trolley goers, the incident also snarled traffic in South Laguna for hours. A traffic alert from the City notified residents of delays on Southbound Coast Hwy “due to police activity” starting at 4:14 p.m. The delays lasted for at least two hours. On Saturday, July 7 at 9:52 p.m., an LBPD officer saw a skateboarder at Aster Street and North Coast Highway not wearing a helmet per the Laguna Beach Municipal Code. The officer contacted the male subject and advised him the reason for the stop. The male subject, who did not have any identification on his possession, was taken into custody for not wearing a helmet while skateboarding. He was later identified as Huntington Beach resident Beau Galloiscosenza, 29. But that’s not all. Also inside the bag were stolen license plates that he allegedly took in Laguna Beach. Galloiscosenza was arrested for the outstanding warrant, possession of heroin and cocaine, possession of a narcotic pipe, and misappropriation of stolen property. Bail was set at $20,000. LBPD responded to the scene but the boys had already fled and were not located. Take heed pool-jumping boys, a Laguna pool-jumper known as “8booth” was still hobbled more than six months after shattering both feet following a pool jump at Pacific Edge Hotel in December 2016. A video of the incident showed him hitting the edge of the pool, falling into the water, and then crawling away from the scene. He was also charged with trespassing. A local grandmother reached out to Stu News on the Fourth of July pleading for help in locating a hit and run driver who struck her 26-year-old grandson, also a Laguna Beach resident, on Tuesday night, leaving him injured on the side of the road. The hit and run happened sometime between 9:20 and 9:30 p.m. on July 3, as the young man was going down the hill from Laguna Terrace, where he lives, approaching the Jewish Temple in the South Laguna shopping center of CVS/Gelson’s. If anyone saw anything or might know someone that was in the area at the time, any tip would be helpful. “My name is Shirleen Blevins; my family and I have been Laguna Beach residents for the past 23 years. I am reaching out to inquire to post a notice in the paper to help find the SUV hit/run driver who hit and left my grandson injured last night,” she said. According to Blevins, her grandson Andre sustained a fractured right elbow, a right radial head fracture and intensive abrasion of the upper extremity. Andre is about 6’4” or 6’5” and weighs around 185 lbs. He’s very active and walks to work to his job as a chef at Driftwood. It will take a couple months of rehabilitation to get him back on the job. She called the accident inhumane, just to leave and not think of the life of another human being. LBPD really can’t do anything she said because he couldn’t give them any information to go on. Stu News has vowed to put the word out. “We’re such a small town and everybody reads Stu News and everybody talks about everything, and I just thought, if just one person reads this and then maybe passes it on to another person someone might know something,” Blevins said. “That’s what I am hoping for. “It’s inhumane to not care about the life of another human being. To just leave him there…it’s just not right,” Blevins said. If you saw something or have any tips at all, please contact LBPD’s Sgt Jim Cota at (949) 464-6671. “I appreciate your help to find this car/driver. He/she either lives or was visiting someone in Laguna Terrace,” Blevins said. Let’s make it happen Laguna! We take care of our own! A second suspect has been arrested in conjunction with the Wednesday, June 27 LBPD arrest of William Hoglund for an outstanding DUI warrant outside of The Saloon. Hoglund was a security doorman at The Saloon and a search of his person revealed five grams of individually packaged cocaine for sale, according to LBPD. In addition to the warrant, he was charged with possession for sales of a controlled substance. LBPD Detectives followed up on the arrest and executed a search warrant at Hoglund’s residence. Inside the home, it was learned that Tyler Benson, 27, was a roommate of Hoglund. A search of Benson’s room revealed additional individually wrapped baggies of cocaine and a large sum of currency. Benson was also arrested that same day for felony conspiracy to commit a crime and felony possession for sale of a narcotic or controlled substance. Both Hoglund and Benson are employed at separate Laguna Beach bar and restaurant establishments. Benson is a graduate of LBHS and was formerly employed as a bartender at a restaurant on Glenneyre Street in downtown prior to his arrest. “Our Downtown Foot Patrol Team has done a fantastic job developing partnerships with the restaurant and bar management and security throughout our town. This is an example of that partnership paying dividends in keeping our city a safe place to live, work and play,” said Cpt Jeff Calvert, LBPD. According to public arrest reports, Benson’s bail was set at $25,000. On Monday, July 2, at the 200 block of Ocean Avenue, LBPD received a report of a black backpack sitting outside left unattended for a few hours. The caller told LBPD that they would like the owner to pick it up. Inside they found that the backpack contained an LBUSD laptop and schoolwork. LB Marine Safety Cpt Kai Bond said that they have been incredibly busy over the last couple of days, especially on Fourth of July, and warns of dangerously high surf conditions through tonight. “As far as our rescue count, we had 59 rescues; we had 69 medical aids, 6,592 public contacts and 3,101 prevents, which is when we talk to the public specifically if they are in a precarious situation and prevent them from doing anything that would put them in danger,” Cpt Bond said. As for beach attendance, Cpt Bond said that it’s one of the busiest days. Because of the holiday they saw large crowds as expected. For the holiday, Laguna experienced warm water temperatures and air temperatures with a high temperature of 74 degrees and the water at about 70 degrees. The surf was 2 to 3 feet and the flag was green. Cpt Bond wanted to warn beachgoers about the dangerous high swell that’s occurring through Friday. “We have a high surf advisory from the National Weather Service,” Cpt Bond said. On Thursday night, Laguna’s beaches had an orange surf advisory that will be elevated to a red surf warning and is expected to peak Friday. With the high-heat advisory, he expects to see large crowds through the weekend. To be in the water, Cpt Bond says Marine Safety recommends that a person should be experienced and have two fins and swimming under an open lifeguard tower. Although the high surf warning was supposed to expire at 9 p.m. Friday, an updated announcement from the National Weather Service said to expect high surf and strong rip currents expected through the night. Partly to blame are the south swells from Tropical Storm Fabio creating high surf at our local beaches and in the area. In addition to the surf, strong rip and longshore currents will make swimming hazardous. If caught in a rip current, swim parallel to the shore and back toward the beach when possible. Never attempt to swim against a rip current. Swell and surf will gradually subside this weekend. On Sunday, July 1, at approximately 11:30 a.m., an officer responded to Boat Canyon Beach amidst reports from lifeguards that a paddleboarder had found a possible phosphorous explosive device in the water. All access points to the beach were closed until the device was removed. The field unit responded to the scene. LB Marine Safety Cpt Kai Bond filled in more details. Once Marine Safety receives a report and gets a visual of the object, they will call in the experts to remove it. On Saturday, June 30 at 3:42 p.m., at the 400 block of N Coast Highway, Marine Safety received a report of a four-year-old girl missing from Main Beach. A frantic mother said that her daughter was last seen on the sand about 20 yards South of Main Beach. She described her daughter as having long brown hair and brown eyes, wearing a blue-ish-green one-piece swimsuit. Lifeguards and LBPD searched the area, south along the wet sand, checking the front of El Paseo and the Boardwalk, down to Oak and Cleo Street. The search and find took 22 minutes, which must have been a long and agonizing time for her parents. However, Cpt Bond said it’s not that unusual for parents and children to get separated at the beach. Michael Byrne, owner of The Saloon, who also owns Roux restaurant with his wife Cindy, went online to reach out to the community after the recent arrest of doorman, William Hoglund, outside The Saloon for an outstanding DUI warrant and also with cocaine for sale. Devastated to hear the news, Bryne didn’t waste any time. He immediately responded to the news about his now-former employee. Byrne said he personally researched the incident for 36 hours. He said they were active in enforcing any illegal behavior and have been known as a bar that would never allow a drug atmosphere to survive. He reiterated that The Saloon is not a drug bar, has never been a drug bar, nor will it ever be a drug bar. “This recent misfortune is a one and done,” Byrne said. Stu News is happy to let readers know that the trapped kitty reported in Friday’s Police Files is happy and healthy and sitting pretty. We heard the news thanks to reader Karl Williams who contacted Stu News, responding to a plea to contact the editor with information about the kitty. Williams is actually the hero rescuer in this only-in-Laguna scenario that ends with a feel-good finale of a freed-feline by a stranger who sprang into action. The trapped kitty, Megan Markel, a four-month-old kitten, adopted not long ago with her brother Prince Harry, hid in the wheel well of Susan Pivovaroff’s Jeep, unintentionally making the long hot trek from Whittier to Laguna. Meghan Markle was covered in dirt, he said. And if the cat was any bigger, she would not have been able to be rescued. But he had her out in six minutes. “I am still processing it right now that her name is Meghan Markle, well, Miss Markle, this is lucky, very lucky this time. It’s not going to happen again,” Williams said. She had just got Meghan Markle and Prince Harry two weeks prior after wanting kittens for a long time. Before she pulled out of the driveway of their Whittier home she said she spotted Harry and Meghan playing together, so the coast was clear to hit the coast of Laguna. “I was driving as fast as I could I couldn’t wait to get here,” Pivovaroff said. Meeting relatives in Laguna, they heard a series of meows for help. “My heart dropped thinking that my kitty was stuck in there,” she said. They even called LBPD. They checked everywhere and even brought cat food and water, but to no avail. After Williams rescued Meghan, Pivovaroff thanked him again for his heroics. On Wednesday, June 27, in the early morning hours, LBPD patrol officers arrested the doorman of The Saloon, William Hoglund, outside of the downtown bar for an outstanding DUI warrant. The individual baggies of cocaine were approximately 1 gram each for a total of just over 4 grams. William Anthony Hoglund, 27, of Dana Point, was arrested for Felony Conspiracy to Commit a Crime and Felony Possession for Sale of a Narcotic or Controlled Substance. “Detectives took the case and wrote a search warrant for his residence,” Sgt Cota said. According to arrest logs online, no bail was issued. Under the same case number, it appears that a second person was involved and arrested on similar charges. However, at the time of press, LBPD was not able to comment on this, and said that more information will follow. 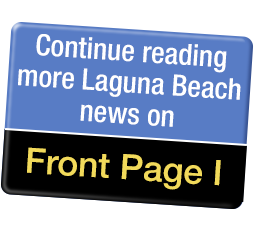 On Tuesday, June 26, LBPD officers responded to the Laguna Beach Inn, at the 2000 block of South Coast Highway, where a woman was reportedly refusing to pay her hotel room balance. According to the caller, she became verbally aggressive toward staff. According to reports, the woman checked in on Monday, June 11, stating that she planned to stay a few days. On Friday, June 15, she extended her stay. On Friday, June 21, she told hotel staff that she wanted to extend her stay again, stating that she wanted to pay in cash. According to LBPD Spokesperson PIO Sgt Jim Cota, “The hotel did not accept cash, so she provided the same credit card that she checked in with. The card was declined. The staff said she did not care and did not provide another credit card. The woman was identified as Carmen Loera by her Nevada Driver’s License. “Loera then claimed to have an allergic reaction to fruit and requested medical attention. She denied transportation to the hospital,” Sgt Cota said. “When the staff stated that they needed to discuss her balance, Loera said she had an agreement for $2,800 dollars for a month, but the general manager disputed this agreement was ever made,” Sgt Cota said. “Loera claimed that the general manager stole her money and that she did not have a balance,” Sgt Cota said. Carmen Reina Loera, 47, of Las Vegas, was arrested for Refusing to Leave a Hotel – Trespassing, a misdemeanor, and for Defrauding an Innkeeper of over $400, a felony. She was transported to the LBPD where she was booked. On Sunday, June 24 at 3:02 p.m., LBPD received a call from a woman at the 600 block of S Coast Highway, about her cat being stuck up inside her vehicle. The woman told LBPD that her cat was lost inside her white Jeep Cherokee between the frame and the panel. To make things worse, the cat had been stuck inside the SUV all the way since Whittier, a 40-mile trip. Poor kitty endured such a cat-a-strophic traverse! Meowing out for help, the cat could be heard but not seen. According to reports, Animal Services was unable to extract the cat from the car. However, the cat’s dad, the caller’s husband, was a mechanic and would be driving to the scene to dislodge the cat. Unfortunately, police logs ended there, and attempts to reach Animal Services for confirmation on the current status of the cat were unsuccessful. On Tuesday, June 26 at 8:19 a.m., at the 3100 block of Via Serena, LBPD received a call about a coyote sighting, actually coyotes. The incident was reported to have occurred the night before, on Monday, at approximately 7:30 p.m. According to reports, the resident saw a coyote mom and her five pups up close and in person on their patio. The caller was concerned that the pack might hurt their animals and asked Animal Services to try to track the pack. “We [were] hurt by them last month,” the caller said. Photo found on Twitter posted by “Pete Fisher"
A similar incident occurred the day before in North Laguna, on Tuesday, June 26 at 9:23 a.m., at the 31100 block of Holly Street – except this time, the uninvited guests were bobcats. On Saturday, June 23 at 6:22 p.m., LBPD received a battery call from a distraught woman in the 20200 block of Laguna Canyon Road, who reported that she had been pushed out of a car by an Uber driver resulting in injuries to her arm and legs. According to police logs, the woman requested medics and waited at the entrance of the park for help to arrive. The Uber driver left about 10 minutes prior to her calling LBPD. The woman told officers that the Uber ride was requested from a friend’s phone, and that she had information about the reported suspect. He was driving a black 2016 4-door Nissan with both Uber and Lyft stickers. She also gave LBPD his license plate number. According to Villwock, LBPD is forwarding a recommendation to the District Attorney’s Office for charges against the Uber driver. On Saturday, June 23 at 3:44 p.m., LBFD and LBPD were dispatched to a structure fire in the 800 block of Manzanita Drive, just above the high school tennis courts. Emergency services received a call from the residents, who reported that there was heavy smoke in the upstairs bedroom. LBPD officers arrived first and quickly evacuated the home, along with neighboring homes on all three sides of the primary residence, and blocked off both ends of Manzanita. Accordingly, evacuations were then quickly made for rear homes on Skyline Drive. LBFD arrived shortly after and were able to knock down the fire quickly, containing it to a single residence. LBFD Chief Mike Garcia gave a timeline of the fire. LBFD dispatched a total number of 17 fire personnel, including one Battalion Chief, four LBFS Fire Engines, an ORCO Truck, and one ambulance to the scene. “We had a “working fire” assignment coming to the incident but [it] was shortly cancelled,” LBFD Chief Mike Garcia said. Nine people were displaced from the residence, including seven adults and two minors, as well as two dogs and a pet snake. “One of the minor children was medically evaluated on scene for possible smoke exposure concerns; parents signed A.M.A.,” Chief Garcia said. At 4:04 p.m., the Southern California Gas Company was contacted with an estimated 40 to 45 minute arrival time. The Red Cross was contacted at 4:17 p.m. to help out the displaced residents. “The cause is unknown and is still under investigation,” Chief Garcia said. On Saturday, June 23 in the morning, a post was made on Nextdoor regarding two people in the 1200 block of La Mirada near Summit being arrested. But the "undercover cops" were not so undercover; they were bail bond agents. “They were working on behalf of a bail bonds company who were following up on individuals evading charges,” LBPD Spokesperson PIO Sgt Jim Cota said. Civilians take this course that work for bail bonds companies. The Arrest and Firearms (PC 832) course consists of two components, which total a minimum of 64 hours. The Arrest component has a 40-hour requirement, and the Firearms component has a 24-hour requirement. These components are divided into 14 individual topics, called Learning Domains. The Learning Domains contain the minimum required foundational information for given subjects. The training and testing specifications for a particular domain may also include information on required instructional activities and testing requirements.